Alright, Halloween is in just a few days so I've been thinking about my Ravenloft/Castlevania inspired mega-dungeon Losh Nekkar. I'm thinking the random encounter tables will be really small, probably only d6 or d8 tables, because there will be lots of planed encounter areas with more interesting stuff, and I don't want a huge number of random creatures running around. So the creatures in each area should kinda be simple stock creatures and make sense for that level of the dungeon Exterior sections will have both night and daytime random encounter tables. Like I said earlier though I want monsters to start to roam and migrate as the players unlock different areas. To this end the 6th entry (or 8th if that's what I go with) on each table will be a redirect to a monster from a random adjacent (and unlocked) area of the castle. So say I'm rolling a random encounter for the Great Hall and I get a 6- which indicates the encounter is a creature from a nearby area. I then randomly determine its from the Ballroom. I roll on the Ballroom encounter table and get a 3- A dancing ghostly couple appears in the Great Hall. If I had rolled a second 6 it would have meant a roll on the Treasury encounter table. Using this method something could theoretically crawl up from the Crypts and menace the PCs out on the Battlements. I'm going away for a bit and might not post for a week or so. I have a question about your map: since it goes both up and down, how will players be able to tell which is more difficult? 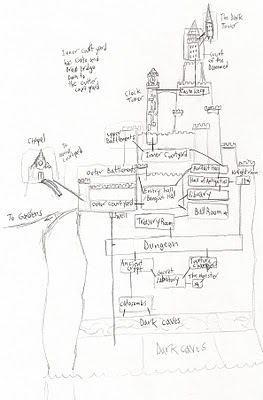 Hey Evan, in general the dungeon will get more difficult the further inward the players go, upward or downward. 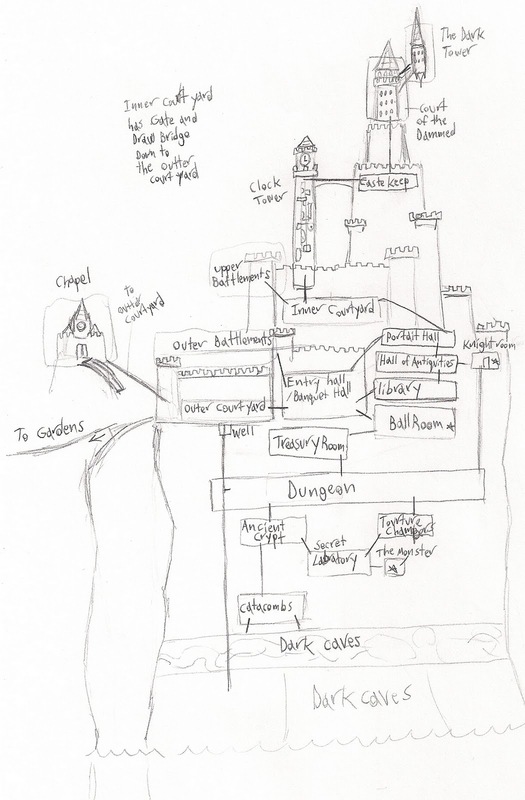 The final boss, the Count, is at the top In the Dark Tower, a crucial artifact which is needed to defeat him is at the very bottom though, in The Dark Caves. Most areas will follow the order they unlock in, in the order of difficulty. Both Court Yards will be pretty safe since they are just areas to travel through. I guess as a DM I will have to be careful to give enough subtle clues about the areas they are entering so that the players will be able to make decisions.